As promised I am using a waste area behind my house – my wildlife garden at the moment! 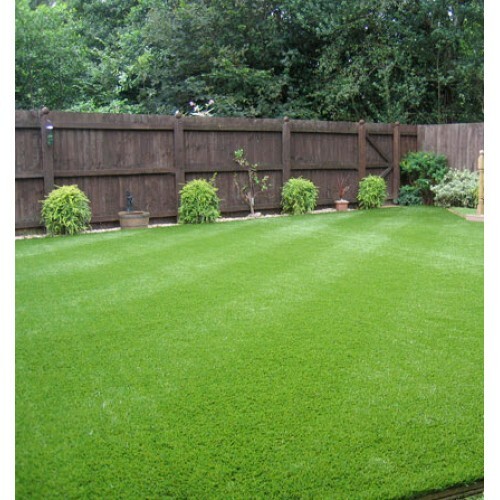 – as a demonstration plot on how to construct a new lawn. The area is approximately 140 square metres, fairly flat, and the soil is free draining light loam with a lot of stones. When I say wildlife garden I mean it has just been left to grow naturally, and only cut twice per year to keep scrub out. There is a substantial amount of weed, particularly ground elder, as well as some grass. Slightly ironic, I know, that I have such a poor lawn myself, but that’s what happens when you spend all your time looking after the lawns of others I suppose! Anyway, it’s time to remedy this situation, and create my own perfect example of a green lawn. My first action in the renovation has been to spray the area with roundup, which kills most green material with no residual action. See the picture opposite for an image of what I’m talking about – this is the area after spraying. Shortly I will dig over the soil, removing weed roots and bigger stones as I go, then leave it to fallow for a few weeks, meaning to allow any remaining weed seeds to germinate and remove them as they appear, before any further work is done. If you are not checking the mower blades every week, as you really should do, then have a look now to make sure the blades are sharp and set level with the bottom knife on cylinder mowers. The Lawn Mower in Action. Do this by using a piece of writing paper to check the cut, and sharpen the cutting edge on rotary mower blades with a file. This is very important to maintain a healthy lawn. More details on this can be found in our full Lawn Care Book. Watch out for drought damage related to lawn mowing during hot spells. If this starts to manifest, reduce your mowing frequency a little as growth slows down and watch out for footprinting. Foot printing is when the grass blades don’t spring straight back up after standing on them, as this is a sure sign the grass is wilting and requires water. Whatever you do dont be tempted to apply fertiliser or iron under these conditions as it will cause serious damage.